Fitness Trackers Didn't Help People Lose Weight : Shots - Health News Researchers were surprised that the young adults given fitness trackers lost less weight than their peers who didn't have the gizmos. Maybe they're not as motivating as we hope. They're so cute. So colorful. But are they really making you fitter? 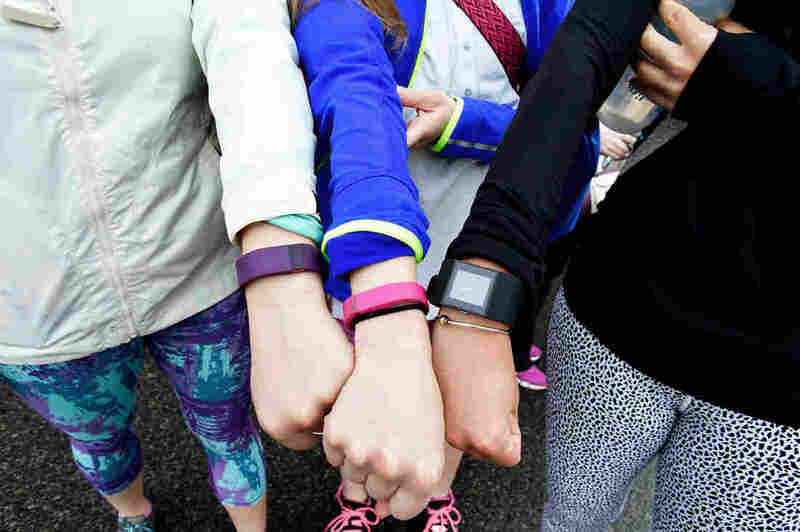 Fitness trackers remain wildly popular, but do they make us fit? Maybe not, according to a study that asked overweight or obese young adults to use the tiny tracking tools to lose weight. The 470 people in the study were put on a low-calorie diet and asked to exercise more. They all started losing weight. Six months in, half the group members started self-reporting their diet and exercise. The other half were given fitness trackers to monitor their activity. After two years, both groups were equally active. But the people with the fitness trackers lost less weight. Wait. What? We asked John Jakicic, a researcher of health and physical activity at the University of Pittsburgh and the lead author on the study, why this could be. "These technologies are focused on physical activity, like taking steps and getting your heart rate up," says Jakicic. "People would say, 'Oh, I exercised a lot today, now I can eat more.' And they might eat more than they otherwise would have." It's also possible, he says, that meeting daily fitness goals and step counts might motivate one person, but missing those same goals could discourage another. The device in the study, which was published Tuesday in JAMA, the journal of the American Medical Association, wasn't a wrist-tracker like the Fitbits, Jawbones, Apple watches and Nike bands many use now. This device was worn around the upper arm. Instead of using heart rate to estimate activity like some devices do, it measured the heat generated by exercise. Still, he says, the results from this study are relevant to the devices of today. Overall the participants without fitness trackers lost 13 pounds, while the tech-enhanced group lost 7.7 pounds. They ranged in age from 18 to 35 years and had BMIs from 25 to 39. The study hopes to see whether helping young adults lose weight early on can head off more weight gain in middle age. We reached out to Fitbit to see what it thought of the study. "We are confident in the positive results users have seen from the Fitbit platform, including our wearable devices," the company said in a statement, adding that researchers use Fitbits and similar devices in clinical studies. While those studies use wearable technology to investigate everything from heart disease to breast cancer, very few have looked at how good these trackers actually are at helping people achieve fitness goals. "There aren't many — if any — long-term studies of wearable tech," says Dr. Mitesh Patel, an assistant professor of medicine at the University of Pennsylvania. Patel also studies fitness trackers but was not involved in this study. This study, Patel says, is the longest yet, "and that's why this research is important. We need more studies like this to show what wearable tech can and can't do." A handful of short-term studies have looked at fitness trackers, with mixed results. One study, also conducted by Jakicic, found that fitness trackers could replace counseling in a weight-loss program. But another found that users get bored and abandon their wristbands after just a few months. Ultimately, Patel says, these devices are most effective when the people using them are already dedicated to tracking their fitness. People who are less motivated might not get the same results. "Overall, it doesn't look like assigning someone wearable technology will make that big of a difference," says Jakicic. So should you bin your Fitbit? Not yet. Jakicic thinks that combining this technology with behavioral research can help scientists figure out which groups of people benefit from fitness trackers and even design interfaces that will be more motivational. "These devices have some really cool tech, but how do you use them in a way that helps people?" asks Jakicic. "That's a science in and of itself."